National races village in Thaketa Tawnship where the Rakhine Traditional Culture and Sports Festival held with a view to preserving the Rakhine Traditional Customs, the Rakhine people who lived in Yangon held this festival for the first time in Yangon. 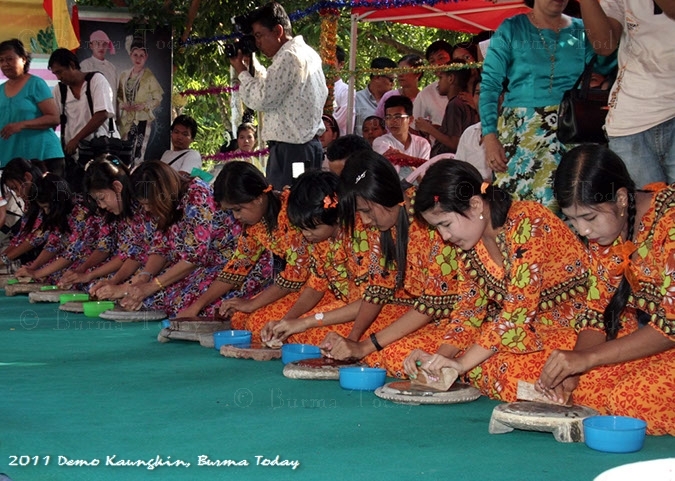 The ceremony was attended by the Rakhine elders in Yangon and was opened with traditional Rakhine dances. There are two kinds of sports events which will take part in this festival. The first event is “Ra-hta-swe-bwe” in Rakhine version, a kind of Tug-of –war. The second sports event is “Kyon” in Rakhine version, which can be defined as traditional wrestling. There are traditional dances and songs programmes which will be included as an entertainment and many shops such as books stall, Rakhine traditional snacks like “Mone-di”, “Kyar-zan-thoke”, “Saw-hlaing-Mone”, shirts as souvenirs, clothing’s and traditional medicine shops are selling in our festival like a trade fair. Firstly, I would like to explain about “Kyon” in Rakine version. It derives from Kyar–Yon. Kyar” means “tiger” and “yon” means “quick”. Therefore, the complete meaning of “Kyon” is the quick tiger. The Rakhine wrestler can be called as a quick tiger because of his ability in wrestling movements and techniques. Kyon” the Rakhine wrestling is very different from other wrestling and it has its own rules and disciplines not to get hurt each other. It wrestler first dances jumping and making special styles in the playground. The two wrestlers have to play three rounds. They are defined as an attacker and one defender. After finishing three rounds, the first attacker becomes the defender and also the first defender becomes the attacker. The attacker who can make the back of the defender falls up to the ground wins the playing round. The first prizewinner will be awarded the gold gong, one tickle weight and for the second prizewinner, the silver gong is awarded. The “Kyon” wrestling is usually performed at the pagoda festivals. We call carriage pulling event as “Rahta-swe-bwe” in Rakhine version, meaning that pulling a kind of tug-of-war. In these sports, two teams including at least 20 persons each side has to compete three rounds. In this event, “Rahta” is made of four big wheels and the wooden frame. On the frame, there are some decorations and some bamboo leaves. Originally, the winner group can get the chance to burn that bamboo leaves. Now a day, the winner groups are awarded the gold medal as the first prize. Nowadays, many forms of entertainment develop like amusement park and concerts. But the traditions are well established that many seasonal festivals and national races festivals are still going strong.